Charles Bentley, a professor of English at prestigious Opal College in the Berkshires of Massachusetts, is forced into retirement when the administration hires Garrison Underwood, an academic star from England, to teach his courses in American literature. Not only does this Englishman take his courses; he immediately occupies Charles’ office. After a heated exchange between them, Charles goes out to the parking lot to cool off. When he returns, he finds that someone has killed Underwood by bashing in his head with a cricket trophy, a trophy that Charles himself had thrown across the room during their quarrel not a half-hour before. Lieutenant Joanna Thorndike, who heads the investigation, soon realizes that a number of people aside from Charles had a motive to kill Underwood. Because she rather likes Charles and appreciates his insights, he soon finds himself assisting her in the investigation. Although events prove challenging, Charles perseveres in trying to find out who murdered Underwood. 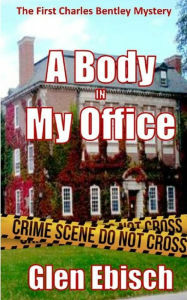 Only after the investigation leads him to some discoveries about his own past and his closest relationships, does Charles find out the truth behind the body in his office.